Most of us have made an excuse for not stretching enough in our day to day. Sitting at a desk or standing at a workstation for prolonged periods of time during the work day can cause muscle tension, stiffness, strain, and fatigue in the neck, shoulders, wrists, arms, hands, back and legs. To prevent this, taking frequent rest breaks to stretch is important. So do yourself a favour, and make the time to do them! 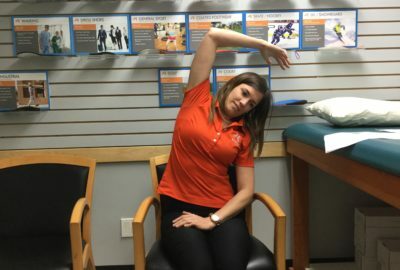 Below is a list of stretches you can do throughout the work day – even right at your desk – that will help prevent muscle strain so you can keep working throughout the day more comfortably. 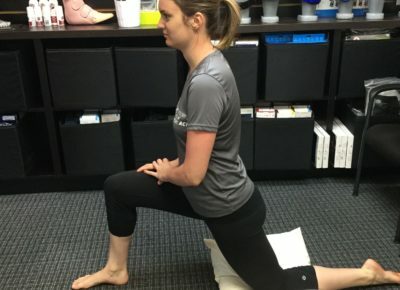 Here are stretches you can do comfortably from your desk chair. Click each photo to enlarge. This is a stretch of the upper trapezius. Reach down and grab the side of the chair with the right hand. Gently pull while tilting your head to the left, feeling a stretch down the right side of the neck and shoulder. Hold for 30-60 seconds, 2-3 times per side. Hold this feeling of tension for 10 seconds. Grasp your hand and hold your fingers with the other hand. Slowly bend your wrist down until you feel a stretch. Hold for 30 seconds. 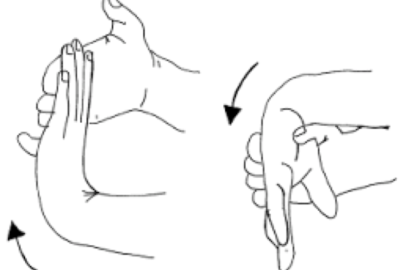 Then, slowly bend your wrist up until you feel the stretch, relax, and then repeat the same on opposite side. This is a stretch of the Lattissimis dorsi. Start by positioning yourself seated with your back straight to the chair. Extend one arm overhead and reach the opposite side. Hold for 30-60 seconds, and repeat two to three times per side. In a seated position, clasp hands together above your head with palms facing outward. Hold for 30-60 seconds, repeating two to three times. Stand facing a wall with your arms straight in front of you and your hands flat against the wall. 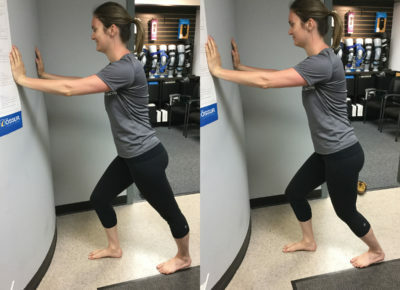 Lean into the wall until you feel the stretch in the calf of the straight leg. Hold for 30 seconds, repeat two to three times per side. Start in a half kneeling position on a soft mat or pad. While keeping a slight forward lean of the torso, tighten the core and contract the glute of the leg with the knee on the ground. Shift the entire body slightly forward. Avoid excessive arching in your lower back. You should be able to feel this stretch at the front of the hip and upper thigh. Hold for 30-60 seconds, repeating two to three times per leg. Start seated in a chair. 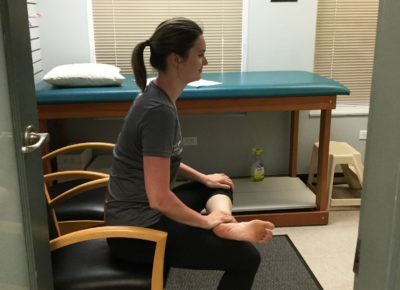 Bring one ankle up onto the knee of the opposite leg. While keeping your back straight, lean yourself forward. You should be able to feel a stretch in the glute. Hold 30-60 seconds, repeat two to three times per leg. Roll the ball under your feet back and forth along the arches to alleviate tension in the muscles and fascia of the feet. Its adjustability makes it perfect for relieving neck and upper back tightness. This tool is great to massage out knots in neck, quads, shoulders and arms. These tools are small enough to keep on your desk, use them any time of the day. All of these great massage products are available at a Kintec near you!